The art used on Hearthstone's cards is one of the most striking and memorable aspects of the game's artistic design. These small yet detailed images are often taken from far larger pieces of art, with only a small section used in the game. More than mere accompaniment for the cards themselves, card art has in some cases directly inspired Hearthstone card design and led to the creation of new cards. While most card art for classic Hearthstone was previously used for the World of Warcraft Trading Card Game, later expansions have seen a far larger amount of original pieces specially commissioned for the game. Where available, full art for each card can be found on individual card pages, or collected on Full art. Hearthstone features card art by a range of highly-respected artists, some of whom have worked with Blizzard to produce art for other games including World of Warcraft. Many of these artists have also worked on other CCGs such as Magic: The Gathering, as well as in areas including comics and concept art. Very rarely, the developers have selected fan art for use in cards. For a full list of artists behind the game's card art, and their related cards, see Artist. The following pages exhibit cards according to the subjects depicted, sorted by race or type. The process of finding art for Hearthstone's cards can take various paths, from finding existing art to match a card, to commissioning new art, to designing a new card specifically in order to match a piece of art. As of February 2014 the card art selection process is undertaken by Senior Game Designer Ben Brode. "The process right now is that I go through all of the art that we’ve made for all different kinds of things. Book covers, other products, comic book covers, etc and I look through it all and try and find the piece of art that best fits the card that we’re designing. Sometimes we see a piece of art that I think is awesome and we design a card specifically for that art. Sometimes we have a card that we’ve never really done a high quality illustration for that character or that monster-type. For instance Acidic Swamp Ooze we had to commission new art for. Card art is sometimes altered to match the customs or preferences of different countries. 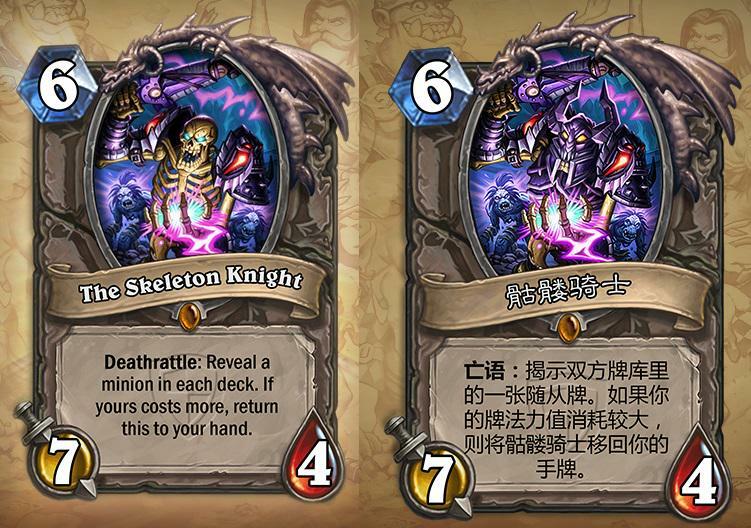 The Chinese art for The Skeleton Knight is one example, reflecting China's regulations about depicting bones and death. "Once name and stats start taking shape, we take a look at the huge breadth of amazing WoW art we already have in our repository. If there's something that fits perfectly we go with that. If we can't find something we are perfectly happy with, the designers work with the art team to put together an art description which describes what that card is like. The art description then goes out to the wonderful artists we work with and we collaborate with them to finish the piece. Sometimes we want something very specific for a card, other times there's general guideline which the artist can run with." Since then, Hearthstone has begun commissioning more and more original art for its cards, with the swelling proportion of original characters featuring in new content only hastening the move away from reusing art. By the time of Whispers of the Old Gods, around 99% of new cards were featuring original art. In a few cases, the developers have consciously chosen to use art which does not actually depict the correct subject of the card. Stampeding Kodo is perhaps the best-known example, the art for which actually depicts a clefthoof; while Malygos in fact features an illustration of Kalecgos. Ben Brode has stated that these were deliberate decisions, based upon the art available for use at the time, and that the developers "felt like most people wouldn't notice or care." However, the developers have since begun commissioning more original art, so this should happen less. The creation of golden card images requires additional work, transforming each static 2D image into a recoloured, animated, moving display. Golden versions always involve adding movement to the image, but some also feature the addition of entirely new elements, ranging from new lighting to dripping ooze, circling flies or glowing runes. The creation of golden card art therefore requires a degree of reinvention, taking the existing art to a new level, and a fuller realisation of its depiction of the subject. Hearthstone's golden card art is created by Becca Abel, Kyle Harrison, John Zwicker and Jon Briggs. Jon Briggs explains that the creation of golden card art is a two-part process. Specific visual effects are created separately to the background art, and then added to the main image through a 'mask', with overlaid shapes determining where and how the effects will appear. When significant movement or effects are involved, the artist will have to paint out elements already in the regular art. For example, animating an arm to swing back and forth will first require the arm to be painted out of the original art, to make room for the new moving arm to be added as a supplementary effect. The base images for golden cards are therefore often simpler than those for regular cards. "The blue indicates where the spinning blade of the shredder would spin, the gray circle is where the mechanical arm would shift up and down, the red denotes where I wanted the debris effect to be shooting off the blade, and the green is where I wanted the smoke and distortion to appear." Each golden card can have up to four layers, limiting the artist to four effects per card. This forces the artist to economise, cleverly reusing visual effects within the same card, such as using Piloted Shredder's smokestack effect to double as burning fire in the eyes and mouth of the shredder. Creating golden art for a card involves a degree of invention. The artists must decide how best to bring the subject to life, which elements to animate, and even when to introduce wholly new elements to the art. When the subject is relatively passive, as with the "sitting lion" depicted in King of Beasts, the artist must find a way to make the golden art interesting and more alive than a simple static image. In this case, Briggs added "a pulsing glow from the torches behind [the lion], a royal waving mane, and some ground dust and straw to finish the piece off." Lore and authenticity are also concerns when designing golden art. The artist must strike a balance between the lore dictates of the subject, often depicting a well-established character or creature type from World of Warcraft, and the practical artistic concerns of making a piece of art which looks striking, coherent and consistent with the card as it exists in Hearthstone. In the case of Fel Cannon, Briggs matched the jerky, motorised movement of the Cannon's World of Warcraft counterpart to add consistency, while with Gahz'rilla, the artist chose to deviate from WoW lore by changing the mighty hydra's "blue ice breath" to a "roaring orange fire breath". Since the card's regular art does not feature Gahz'rilla's breath, the clashing colour scheme was not problematic in the original art, but the animation of the card brought the issue to light, with the artist forced to choose between perfect fidelity to lore and a more "solid looking effect" for the card. In some cases the designers may choose to add significantly new elements to a card's golden version, as with Sneed's Old Shredder, which at Eric Dodds' and Jason Chayes' request saw the addition of laser beams shooting from the shredder's eyes. Summoned minions such as Dr. Boom's Boom Bots provide a special opportunity for synergistic art. In this case, while the two cards are not taken from the same piece of art, Briggs chose to add the same lightning from Dr. Boom's art to the background of the Boom Bots, producing continuity and a sense of shared space across the three minions produced by playing the card. While the artists aim to make golden art impressive, successfully bringing the subject to life, the intention is to "add to the visual experience", rather than distracting or having the animation become the focal point. The animations for the golden Shadowboxer and Goblin Auto-Barber were originally 400% faster than their final versions and had to be significantly slowed, while the original animation for Noble Sacrifice saw the Defender moving from left to right until he disappeared from the image entirely. Excessive visuals also have the potential to be confused for effects depicting gameplay mechanics, such as animated smoke on rogue cards resembling the Stealth effect, or animated red glow which could easily be mistaken for an Enrage effect. ↑ Ben Brode on Twitter. (2016-04-04). ↑ 7.0 7.1 Ben Brode. (2014-06-07). ↑ Yong Woo on Twitter. (2013-12-15). ↑ 10.00 10.01 10.02 10.03 10.04 10.05 10.06 10.07 10.08 10.09 10.10 10.11 Hearthside Chat - Golden Cards with Jon Briggs. (2015-03-05).